The Star Casino has been open over 20 years and provides extensive gaming as well as great entertainment facilities. The Star Casino in Sydney has been providing top-class gambling services for over twenty years. From poker to blackjack, craps and roulette to electronic bingo and private gaming, the casino itself is the second largest in Australia. The complex also extends to provide over 350 luxury hotel rooms and offers extensive entertainment facilities to visitors, guests and gamblers. In this guide, we take a look at what the Star Casino Sydney has to offer and give you all the information you need, at a glance. Owned and operated by the Star Entertainment Group, The Star Casino Sydney is the only licensed casino in the Harbour City and in New South Wales. The company also holds the license for the Treasury Casino, Brisbane and The Star Gold Coast. It is a wholly owned subsidiary of Tabcorp, the company behind the OzLotto. Following an extensive refurbishment in 2011, the Star Casino is a luxury complex in the heart of the city. Image via website. Opened in 1995, the Star is Australia’s second largest casino behind Melbourne’s Crown Casino. It was renovated in 2009-2011 with a total $961 million spent to extend and improve the facilities of the entire complex. This followed an extension of the original license granting the Star Entertainment Group an exclusive casino license until 2019. The casino itself is split over two gaming floors. The main gaming floor on level one is a general admission suite with the Sovereign Room on level three providing a VIP gambling experience. The Sovereign Room features private gaming as well as the famous Inner Sanctum; a high rollers suite where table bets start at $100 but can go as high as $500,000. Membership is required for entrance to these elite areas and are popular with international junket players. Recent refurbishments have added an ultra-elite area known as the Vermillion Room to which entry is by invitation only. At present, only 100 guests have been allowed access to this exclusive area and the value of the games here can only be guessed at. The general admission gaming floor is split into three main areas; table gaming, electronic gaming machines (or ‘pokies’) and poker. The Star Casino has 40 poker tables and runs a range of weekly events and tournaments to encourage new players and attract visitors to the casino. Public holidays are celebrated with a deal-in tournament offering a guaranteed prize pool of $50,000 and a buy-in of $550. Start times vary so check the website for details. 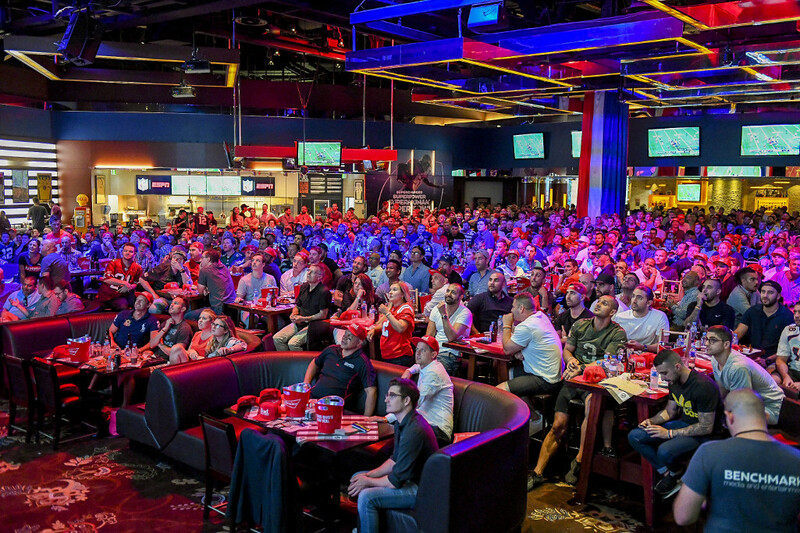 The casino has been the home to the WSOP event in Sydney since 2016 and it is expected to host this prestigious three week tournament again in 2018. The main poker tables play a variety of games including Texas Hold’em, Mississippi Stud, Three Card Poker and Caribbean Stud Poker. They also host Ultimate Texas Hold’em with the chance to win up to 500 times the payout when winners play a Royal Flush. There are 1500 licenses available at the Star Casino offering a range of slot and pokie style games including bingo, rapid roulette and video poker. You can even choose to play Blackjack, Baccarat, Roulette and Sic Bo at The Stadium; a 15m x 3.5m mega screen makes the action more intense and cinematic (apparently). Situated on the second floor, the Star Social Lounge hosts Bingo every Tuesday, Thursday and Saturday as well as Mahjong on Monday, Wednesday, Friday and Saturday. Entry is for Star Club members only. The Sports Bar is open 24/7 and offers continuous coverage of major sporting games including soccer, cricket, NBA baskeball and American Football. Major events attract quite a crowd and the bar holds pre and post event entertainment such as cheerleaders, face-painting and discounted drinks. The bar also offers paperless TAB facilities. The sports bar has non-stop screening of international games and major events get great coverage. Image via website. The Star Casino is part of a larger complex which incorporates a luxury hotel (The Darling) and award-winning spa with 171 luxury rooms, gym and a 25m outdoor swimming pool. There is also the Astral Tower which provides additional accommodation in the form of 180 hotel rooms, suites and penthouses as well as three high-end studios. These three themed ‘playgrounds’ offer a modern and stylish suite of rooms for special occasions and can accommodate up to 25 guests. The studios are styled after ‘70s Glam’, ‘Cyberpunk’ and ‘Dark Romance’. Many of the penthouses and suites are privately owned and are serviced by the Star Entertainment Group. The facilities extend to provide night and day entertainment, casual and fine dining as well as bars and a nightclub. Views from the Star Casino across Darling Harbour and the rest of the city. Image via Flickr. The ground floor central atrium offers a range of boutique retail shops including Gucci, Chanel, Bottega Veneta and G-Star Raw. The site is also home to several conference and events spaces which host a range of commercial and private functions. The Star Casino Sydney is open 24 hours a day, seven days a week. The Star Casino is situated at 80 Pyrmont St, Pyrmont NSW 2009. The casino is set back from the Pirrama Road and overlooks both Darling Harbour and Pyrmont Bay Park. There is a car park on site but space is at a premium with Star Club members receiving priority. Parking is free if you dine at The Star but does not include valet parking. There is alternative parking close by (details available via the website). The casino offers transport to and from the venue via the Star Express Coach; a fleet of chauffeured coaches that pick up and drop off in and around the city. You can find details of the routes and costs here.